R-STUDIO is the most comprehensive data recovery solution for recovery files from NTFS, NTFS5, ReFS, FAT12/16/32, exFAT, HFS/HFS+ (Macintosh), Little and Big Endian variants of UFS1/UFS2 (FreeBSD/OpenBSD/NetBSD/Solaris) and Ext2/Ext3/Ext4 FS (Linux) partitions. It also uses raw file recovery (scan for known file types) for heavily damaged or unknown file systems. It functions on local and network disks, even if such partitions are formatted, damaged or deleted. Flexible parameter settings give you absolute control over data recovery. Host OS: Windows 2000, XP, 2003 Server, Vista, 2008 Server, Windows 7, Windows 8/8.1, Windows Server 2012. Data recovery over the Network. Files can be recovered on network computers running Win2000/XP/2003/Vista/2008/Windows 7/8/8.1/Windows Server 2012, Macintosh, Linux, and UNIX. Recognition and parsing of Basic(MBR), GPT, and BSD (UNIX) partitions layout schema, and the Apple partition map. Support for Dynamic volumes (Windows 2000-2012/8.1) over MBR and GPT. Support for Windows Storage Spaces (created by Windows 8/8.1 and 10), Apple software RAIDs, and Linux Logical Volume Manager (LVM/LVM2). R-Studio can automatically recognize and assemble the components of these disk managers even if their databases are slightly damaged. Their components with severe corrupted databases can be added manually. Get Info panel has been added to the Content pane. Detailed information about a selected file. Extended file information in the Technician version like disk regions, overlapping files, etc. Advanced options have been added to file recovery lists in the Technician version: specific file system info, overlapping files, disk regions, etc. Files in Extra Found Files (raw files) can now be automatically excluded from recovery if they are duplicates of files found in the real file system. The algorithm for estimation for file recovery chances has been improved. Memory usage has been optimized and debuged. The Reset button has been added to the RAID Parents tab. It resets RAID parameters to those set by the Apply button. Some text lines did not change when the interface language was switched. Fixed. 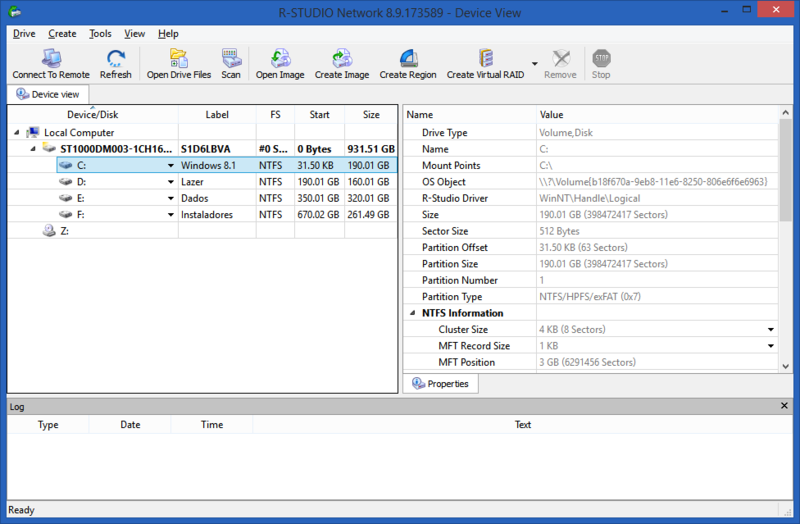 R-Studio may have temporally frozen when opening an NTFS partition with many compressed files. Fixed. R-Studio may have opened APFS partitions with many files for long time. Fixed. 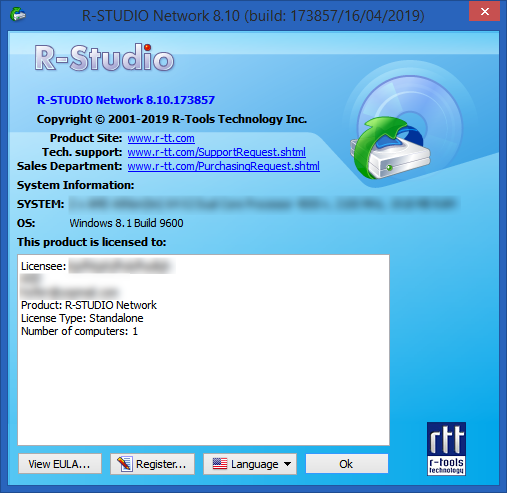 R-Studio may have temporally frozen when a Partition tab with very many files was closed. Fixed. The Find Previous Version of the File command may have worked incorrectly. Fixed. Mask presets may have loaded incorrectly. Fixed. Dates nay have changed incorrectly in the File Mask dialog box. Fixed. Some file dates may have been saved to File Mask presets incorrectly. Fixed. Multiple files that occupy the same sector may have been shown incorrectly in Text/hexadecimal editor. Fixed. If files were manually unmarked, they could not be marked for recovery using the File/Mark dialog box. Fixed. Existing files may have been shown as deleted in cross-linked folders on FAT32 partitions. Fixed. R-Studio may have crashed when opening disk images. Fixed. The Show Files command in Text/hexadecimal editor may have stopped working if file region enumeration was interrupted by the user. Fixed. The Details/Icons view may have switched incorrectly when switching opened partitions. Fixed. Units in the Size fields on the Find/Mark dialog box were always reset to Bytes. Fixed. R-Studio may have frozen or crashed when the Reopen Drive Files button was quickly clicked several times. Fixed. Sometimes mdadm RAIDs could not be automatically assembled from images. Fixed. The Apply changes immediately option could be enabled only by the second time. Fixed. An incorrect RAID layout could be saved. Fixed. Any changes in the the Block order table defaulted all other RAID parameters. Fixed. R-Studio may have frozen when one LDM disk was disconnected and the Reassemble button was clicked. R-Studio was crashed with Text/Hexadecimal editor was opened from the Block information window when working with DDI. Fixed.